On the eve of the wedding, I asked my sister if she is going to stuff glutinous rice balls down her son’s throat. LOL. Normally, what Chinese Taoists do is to pray to their theen koong and feed the groom/bride-to-be tong yuen to signify wateva (sorry I am not sure). My niece also had her hair combed by the parents. But since we are in Singapore, it was too much of a bother so forget about the tong yuen. First, the groom went to the bride’s home to pick her up and get tortured with the usual wasabi and tabasco stunts. We didn’t follow along. Then, the groom brings the bride home. My little boy was awfully cute in his suit. His job was to open the car door. I am so glad he was so cooperative on that morning eventhough we had to wake him up around 8 am. I bribed him that he will get an angpow that can buy him a Ben 10 toy. After the tea, it was the church wedding and later on, the dinner at Four Seasons Hotel in Orchard Road. Gosh, the dinner costs SGD1,400 per table. That’s about RM3,400 per table or RM340 per head. 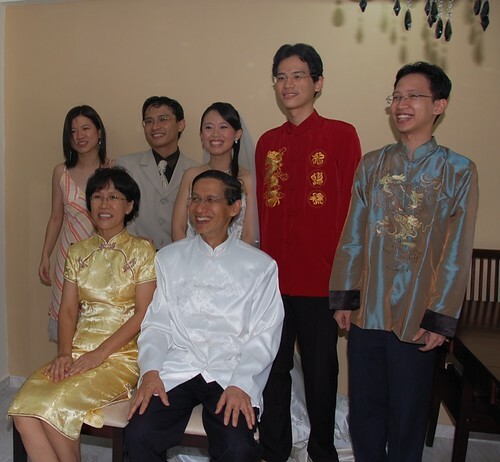 OMG, sons, all four of you better don’t marry any girls from Singapore, Hongkong or Taiwan because your father and I are too poor to finance your wedding, ok. Please find some girls from India which pays dowry to ME, ME, ME instead! LOL. More about the dinner that costs RM340 per head in another post. The above is the cake cutting ceremony. 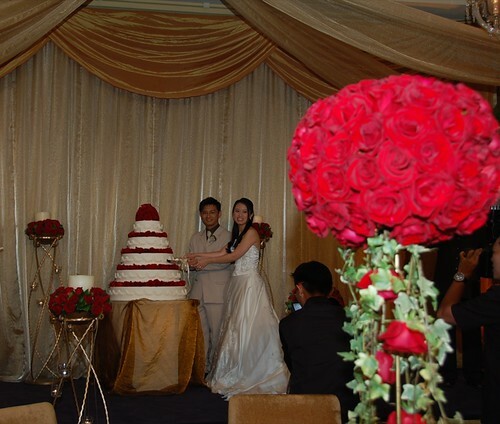 The huge red rose arrangements are made with real, velvety red roses. I had to touch, smell and tear the petals to believe that they actually decorated the whole banquet hall with fresh red roses. *faints* Boh pien, I am a Penang suakoo. sing ning ok ma!!! i am also a sing ning woman la!!! Wow the bride has beautiful smile! But then again.. all brides are happy on their wedding day! Congrats to the happily married couple! awwwwww..your son is so adorable..so he got angpow for opening the car’s door or not? No siew chu ah? Yum yum. I know that one to signify that the bride is still a virgin. I wanna see your little boy in his suit can ar? The picture above he kena blocked by the other photographer liao lar. *chants i dunwan to marry sg girls* LOL! Angpow from Sin guest S$300-500 per couple! What is the adverage angpow from Malaysian guest/couple? to their Sin. Host’s wedding ? Wow lucky boy got to open the door. Hehe. Simply wedding it is a Chinese wedding tradition !! Lucky boy got to open the door of the car..